A modified DS 7 Crossback with an opening roof and a flag holder was used by French President Emmanuel Macron for his inauguration. 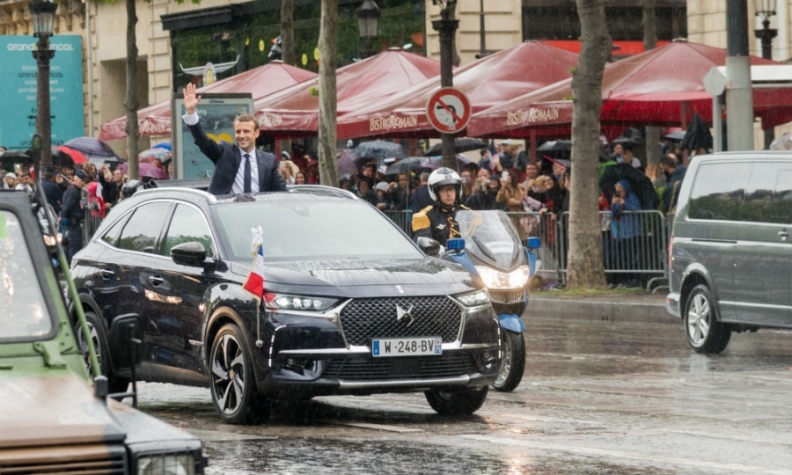 PSA Group's upscale DS brand got a boost after its latest model, the DS 7 Crossback, was chosen as the official vehicle for ceremonial duties during the inauguration of new French president, Emmanuel Macron. Macron chose to ride in a modified DS flagship with an opening roof so he could greet crowds lining the streets in Paris on Sunday. The DS 7 Crossback will lead planned wave of new DS cars over the next six years when it goes on sale in January. PSA said it will display the "Presidential DS 7 Crossback" used by Macron at its DS World Paris showroom. Some of its advanced technical features will be available on models sold to the public, PSA said. These include "Connected Pilot," which has semi-autonomous driving features and "active scan suspension," which uses a camera to anticipate bumps and undulations in the road to ensure a smooth ride. Macron is a 39-year-old former investment banker and pro-EU centrist. In his first words after taking office on Sunday, he pledged to restore France's standing on the world stage, strengthen national self-confidence and heal divisions that the bitterly-fought election campaign had opened up.